We went back to the Woodbridge build last night, the story began six years ago when Lucie Fairweather and Nat McBride set out to build an affordable eco home for their family. However before the project got off the ground the couple discovered that Nat had cancer and within a few months had passed away. However not discouraged by the loss of her husband, Lucie decided to carry on with the project with the support of family and friends and build the dream home the couple had envisioned. There were huge demands on widow Lucie who was now a single working mum who not only had to support her family but also work on the new home. They set out to disprove misconceptions of eco houses at the time, with a modern and contemporary build which also has to fit into the tight planning restrictions of the area. The home had to be multipurpose for the family to live and work in, making the most out of the small site. The home was designed to be quite open planned and light as well as being functional for their two children. For many people delays and problems come from building issues, not the death of your spouse, however with Lucie choosing to carry on shows, the determination which she had throughout the build process. There were some changes from the original design, to fit the new reduced budget, however Lucie did still manage to salvage a lot of the eco designs and keep costs down. When revisiting this modern and eco build, we find that Lucie still loves the overall look of the home. The home shows how functional it is with the rooms changing use over the years to fit the families changing needs. However the heart of the home is still used the same. The modern and light bathroom, featured a simple and seamless design with white tilling, interlaced with coloured lines from the walls and down the side of the bath and across the floor. Villeroy and Bock stock a fantastic range of brightly coloured tile which you can use to re-create a similar look, with colours of your choice. Simple toilet, bath and sink in white. If you like the tilled bath idea, fit a Roca Contesa ECO Steel bath 1700 x 700mm bath with cladding around which you can tile. We also stock, beautiful and simple Grohe taps which offer the same great style found in this bathroom. For more ideas, seen in the show and others, please check out our Grand Designs page. When designing their dream bathroom many people forget about the lighting, but for us it is one of the most important decisions. The correct lighting can have a dramatic effect on a bathroom, turning it from a surgical and almost operation room like feel into an ambient, relaxing and colourful environment that you can enjoy time after time. This illuminated front bath panel from Roper Rhodes takes LED technology to a new level. Featuring 5 cool glow LED lights flush mounted into a high quality panel, these are perfect for creating a relaxing environment perfect for a night time soak. Available in gloss white and walnut finishes, the Roper Rhodes Illuminated bath panel is ideal for those looking to create their own bespoke bathroom. As well as the front panel, there is also an option to have back and side panels along with matching corner posts making these products suitable for flush to wall or freestanding baths depending on your design. For those who want to add a modern touch to their bathroom, the Ideal Standard Moments Designer Bath creates a great statement. Available in a range of configurations including front and back illuminated panels, and side storage units this bath looks great and is practical too. The Ideal Standard Moments Designer Bath can be mounted flush to the wall or positioned in the centre of the room to create a freestanding fixture. If your one of those people who get up in the night or have children that do then these handy motion sensor lights are a great way to not disturb people by turning the main lights on. These thin profile LED lights are easy to install and can be positioned just about anywhere. The Unique Lighting Motion Sensor LED Light is activated when it senses movement and automatically turns itself off to save battery life. The waterproof design means that these lights are perfect for the bathroom and can even be used outdoors if required. Each light takes 4 AA batteries which can provide power to the device for up to a year before needing replacing. The Unique Lighting Motion Sensor LED Light is available as a single unit or in a pack of three. German company Grohe has long been associated with cutting edge technology and fantastic design and have done it again with the Grohe Nova LED Dual Flush Button. This contemporary piece features a dual flush module combined with a coloured LED ring perfect for illuminating your bathroom in the dark. Choose the colour of the LED ring to match your bathroom or your mood, or pick a constantly changing spectrum it’s up to you. There is also a handy timer so that you can program the device when to come on and switch off to save energy. Like something from a Sci-Fi movie, the Geberit Sigma 80 Touchless Dual Flush Plate is a marvel of technology and design. No longer just a feature reserved for high-end hotels and restaurants, this space age device can now feature in your own ultra-modern bathroom. Using just the wave of a hand you can control whether you want a big flush or a small flush, and because you are not directly touching the device it ensures a hygienic and clean environment. This module is fully customisable with five different colours to choose from and you can also adjust the sensitivity to prevent accidental flushing. This product requires mains power and the Geberit Sigma 80 Transformer to operate. In a leafy suburb of London, young couple Ben and Rachel Hammond and their two children come across an ugly, inefficient and uninspiring red brick property whilst looking for the perfect plot of land. However instead of tearing it down, they decide to completely re-design it. Retrofitting and re building the home instead of starting a fresh, which is a much harder job, than building a new home on the land. The couple look to change the whole concept of the home whilst keeping part of its structure, well three and a half walls. They are adding a double extension which wraps around the body of the home. The inside of the home will be open plan with crisp and modern fixtures and fittings. Including modern technologies, creating an eco-friendly property. They are hoping to move into their new home in 8 months whilst they are renting. However projects never run smoothly or finish on time, will this weeks be any different. The simplicity of the design follows into many of the rooms including the bathroom. With wonderful views out across the park behind the house, the bathroom, is a sleek and modern room. Featuring a soft moulded Royce Morgan Onyx Freestanding Bath and simple taps. The bathroom has a very fresh and light feel. These wonderful free standing baths are available on our website and are perfect if you’re looking at adding a touch of luxury to your bathroom. More items as seen in the show can be found on our Grand Designs page, and others from previous episodes. If you would like to move away from the standard square edged bathroom cabinet to something which has softer lines, you will find a wide choice at the bathroom cabinets’ pages on our web site. We can offer a huge range of cabinets, with or without lighting and built in shaver sockets, to circular styles and recessed models, one, two and three door cabinets standard or corner fittings. There is a model to suit your needs. One example is the Gelson Loire soft close single door mirror cabinet which features an elegantly arched mirrored door and gorgeous brushed metal and frosted glass overhanging light fitment, the Loire will be the star feature in any bathroom. The soft close door, shaver socket and fixed shelf deliver the definitive storage option, and it looks good too! The modern bathroom cabinet of today is light years away from its p predecessors in every sense of the word. The lighting in modern bathroom cabinets is low energy often LED which is green on energy consumption but giving outstanding illumination. The Gelson Danube is a larger version of the popular Seine cabinet and comprises three mirrored doors, three down-lighters and one shaver socket combine with adjustable shelves to create the ultimate in bathroom storage! The generous cabinet is 100mm wide 800mm high and has a depth of 170mm although the canopy which houses the LED lighting extends a further 270mm. Not only will your bathroom be enhanced by the addition of this classy bathroom cabinet, but you will be able to store all those essentials neatly behind those mirrored doors. As many busy people know keeping a bathroom or shower area tidy can be a challenge, more so if the room is small and putting large storage unit on the wall or using freestanding can be difficult or even impossible. The answer can lie with the Showerlux Stowaway unit which is a cleverly designed corner unit. With a size of 175(w) X 125(d) X 700(h) mm’s in white finish with two shelves sideways sliding doors, designed to help your bathing area free of clutter. The unit is ideal for use for soaps, gels and shampoos, is economical on wall space and makes a perfect companion for an over bath shower. This is only one of the many units which are available to help with keeping your bath or shower rooms tidy. Lighting in a bathroom is almost as important as some of the fittings and accessories which most of us seem to favour. Changing your bathroom lighting can make a huge difference to the overall look of your bathroom, by simply changing the light fixtures your bathroom can appear modern and new. Mirrors and lights work for bathrooms, just having a mirrored light in your bathroom is a superb way of transforming your bathroom for low cost. The mirrors will not only open up your bathroom but the lighting on the mirror can change the appearance of your bathroom and mirror lights are an excellent way to light the room. 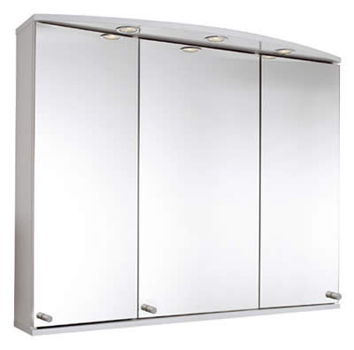 The Gelson Danube three door mirror cabinet not only gives you lighting from three down-lighters, there is a shaver socket and the shelving is adjustable for the ultimate in bathroom storage facilities and lighting finished in cool white. The modern bathroom or en-suite has many more cosmetic products than it ever used to and the ongoing problem of storing these without the room becoming cluttered could be a problem. However it is now possibly to keep your shower enclosure clutter free by hiding soaps, gels and shampoos in this cleverly designed discreet shower store from Showerlux. Every Showerlux product, whether manufactured in the UK or abroad, meets stringent quality and safety standards, complying with ISO 9001:2000 and is supported by a comprehensive 10 year warranty. To support the high quality products, the Showerlux team endeavour to maintain their excellent reputation by delivering the highest levels of customer service at all stages of the purchasing process including after sales and technical support. Continuous investment in design and innovation ensures customers can rely on Showerlux to provide them with an endless choice of products to compliment current trends and meet their specific needs, check through these at our pages.